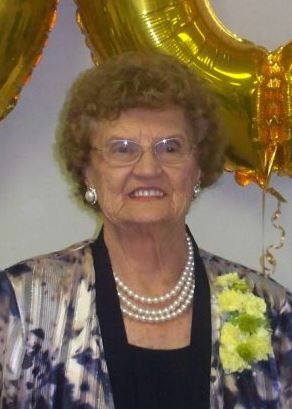 Mary Dietrich, 96, of West Milton, OH died peacefully on Monday, April 1, 2019 at Brookdale Assisted Living in Englewood, OH. Mary Irene Dietrich (Nee Hollinger) was born on June 3, 1922, near Gettysburg, Ohio, but grew up on a farm in Ansonia and later off of SR 571 east of Greenville. Mary graduated from Greenville High School in 1940. She worked for JC Penny Co. in Greenville for 5 years and later was a successful Avon representative from 1963-1984. She was married to the late Carl Dietrich and they resided most of their life on Shiloh Rd. until his death in 1981. Mary was active in the community through her membership in numerous organizations and her Love for social gatherings and business contacts. She moved to West Milton in 1983 living on Stillwater St. before moving to Donna Jane Ct. in 2000. She was a life time member of VFW Auxiliary 8211, The Sunshine Grandmothers Club, and a member of the West Milton Senior Citizens Club and a member of Potsdam Church of the Brethren since 1949. Her hobbies included playing cards, cooking, fishing, and gardening. Besides her late husband, she is preceded in death by her parents Ray and Rebecca Hollinger, grandson Grant Dietrich and brother-in-law Paul Baker. She is survived by a sister Thelma Baker of Greenville, sister-in-law Betty Dietrich of Arcanum, Ohio, daughter Diana Dietrich Webb and son-in-law Doug Webb of Lakeside Park, KY and son Jim Dietrich and daughter-in-law Nita Dietrich of Union, OH. She is also survived by 7 grandchildren, 16 great grandchildren, 9 great great grandchildren and numerous nieces, nephews, and cousins. Viewing will be at Hale-Sarver Family Funeral Home, 284 N. Miami St, West Milton on Thursday, April 4, 2019 from 5-8 PM. Funeral service will be held 10:30 AM on Friday, April 5 at Potsdam Church of the Brethren, 22 E. Cross St, Potsdam, OH 45361. Burial will follow in Mote Cemetery near Pitsburg, OH. If so desired, memorial contributions may be made to Potsdam Church of Brethren, 22 E. Cross St, Potsdam, OH 45361.